I should of thought of having someone post such a nasty review and then scream at them for my book. That is a very good point Rogue! After all look what it has done for an unknown 13 year old lately....everybody knows about her song Friday! If you read the comments through on that link...she has done herself a disservice with the review community...so it could have backfired on her, horribly! Thanks so much for linking to my post! Glad it helped. And I love the title and cover of your book, Bones. Totally fun! Bones was totally fun to write! Lisa Gail Green's post on the poison apple was so insightful. I think everybody's pretty sad about what happened with the Greek Seaman debacle. Nathan Bransford had a great post about it yesterday. And thanks for commenting on my piece about it. We need to develop thick skin to survive in this business. So, did you get to have some of those chocolate martinis? 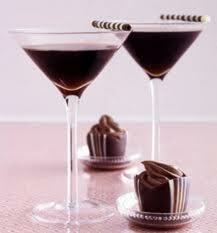 I had chocolate....I had coffee....I failed miserably in the martini stakes....tho I drank more wine than I usually do.